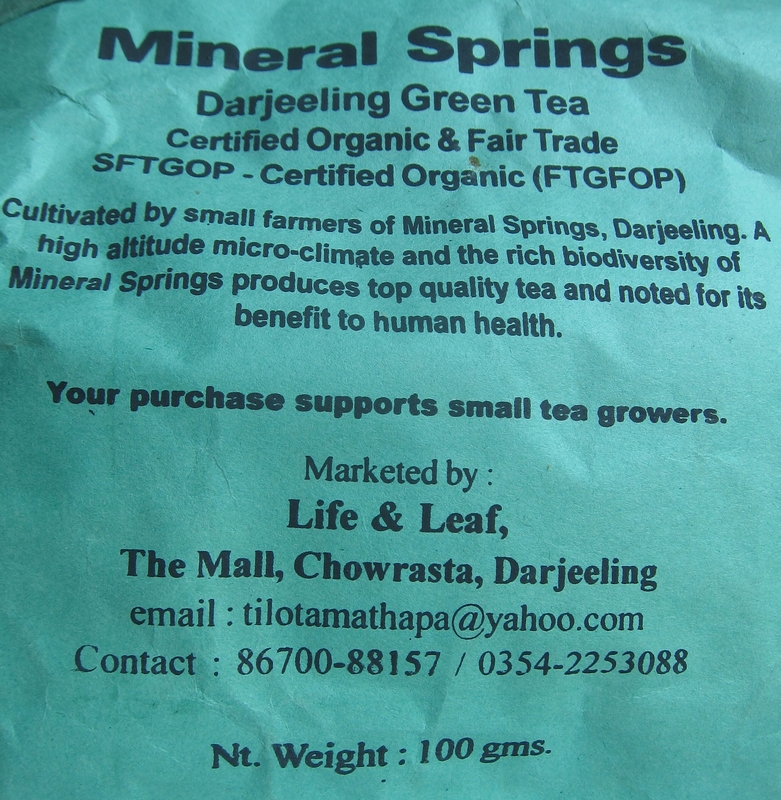 At the Life & Leaf Fair Trade shop in Darjeeling they were selling some organic tea produced in Darjeeling by “Mineral Springs.” Unlike the last tea garden I visited, the Makaibari Tea Estate, Mineral Springs is not listed by the Tea Board of India as one of the 87 Darjeeling Tea Gardens, so I was curious to find out more about it. Searching online I found information about homestays there, so I sent off an email and booked a few nights at “Zimba’s Homestay” at Mineral Springs. 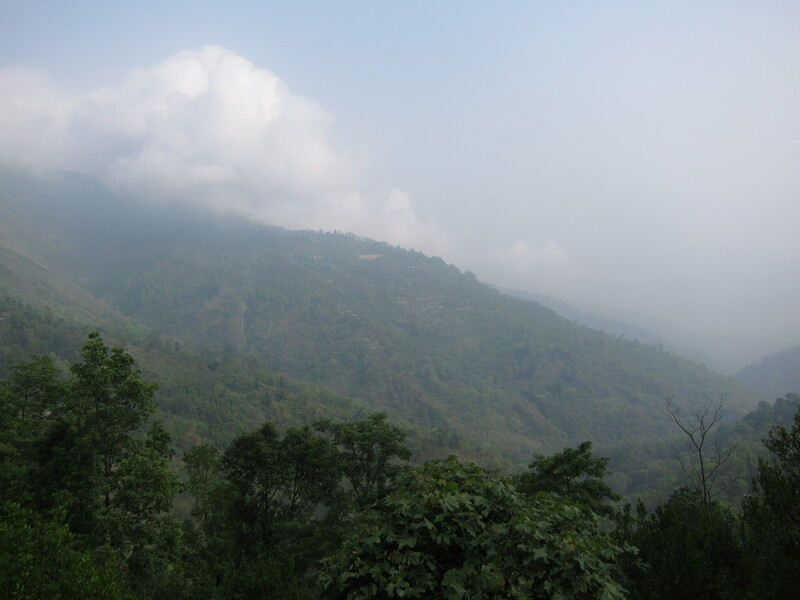 On Friday, April 22, I took a shared jeep from Judge Bazar in Darjeeling to Mineral Springs. 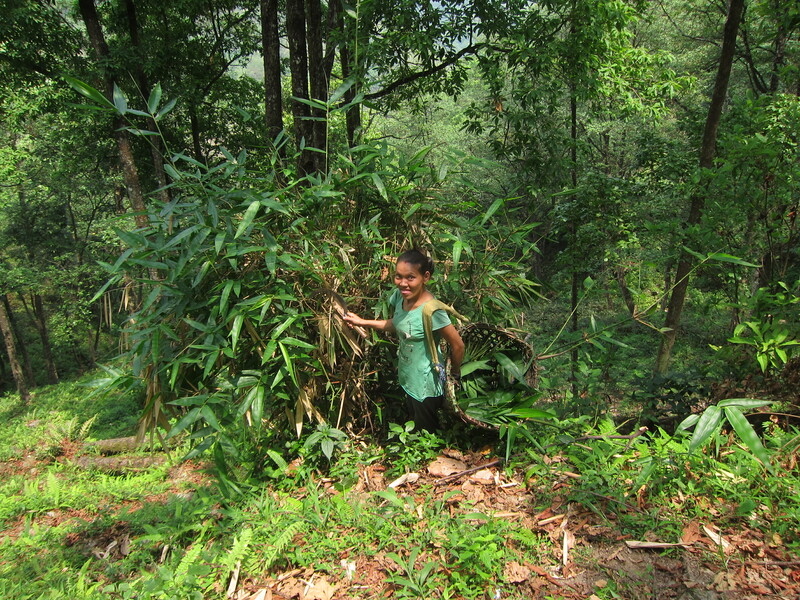 We drove north of Darjeeling town, then down into a green, leafy valley about an hour away. The jeep left me at the home of Passang, the owner of Zimba’s Homestay. Over the next few days, Passang guided me around Mineral Springs, now also known as the Sanjukta Vikas Cooperative, and introduced me to Navin Tamang, the owner of Tathagata Farm, which is part of the Cooperative. Speaking with them I learned some fascinating things about the history of Mineral Springs and the Cooperative. The land was formerly the Harrison and Mineral Springs Tea Estate, which closed down in the 1950s and was abandoned by its owners. The people living in the villages on the estate, mostly Nepalese brought in by the British as tea workers, continued to practice subsistence farming, growing and selling tea and other crops to make ends meet. At some point people started “land grabbing,” and this went on for many years. Finally, in the late 1990s, with the help of local NGO DLR Prerna, the villages organized themselves into the Sanjukta Vikas Cooperative. The cooperative has around 450 member families in 11 villages, or “units.” All the members are smallholders, with some owning plots of less than an acre and others having several acres. The Cooperative is now certified Organic and Fair Trade, and produces around 60,000 kg of tea annually. Getting food for the cows. The Cooperative doesn’t have its own factory, but sells its raw leaf to Tea Promoters of India (TPI). TPI processes the tea at its factory on a tea estate that is licensed by the Tea Board of India as a “Darjeeling” garden, then sells the tea under the Darjeeling Geographical Indicator (GI) logo. (The Cooperative has plans to build its own factory in the future, but getting a Darjeeling GI license may be difficult as the current 87 Darjeeling gardens will likely lobby to protect their franchise). Restaurant at Tathagata Farm. 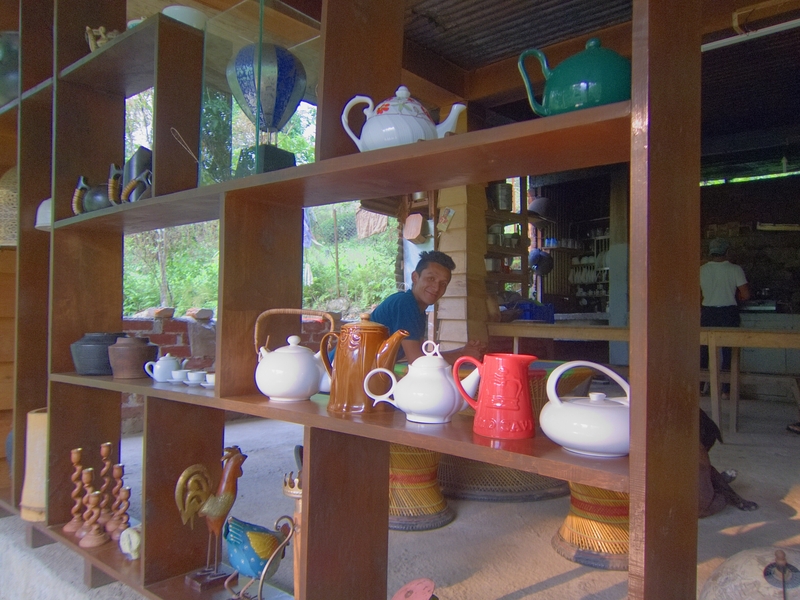 My homestay host, Passang, is peering through from behind the shelves. Tea here is not grown as a monoculture, plantation crop, but is intercropped with many other plants. 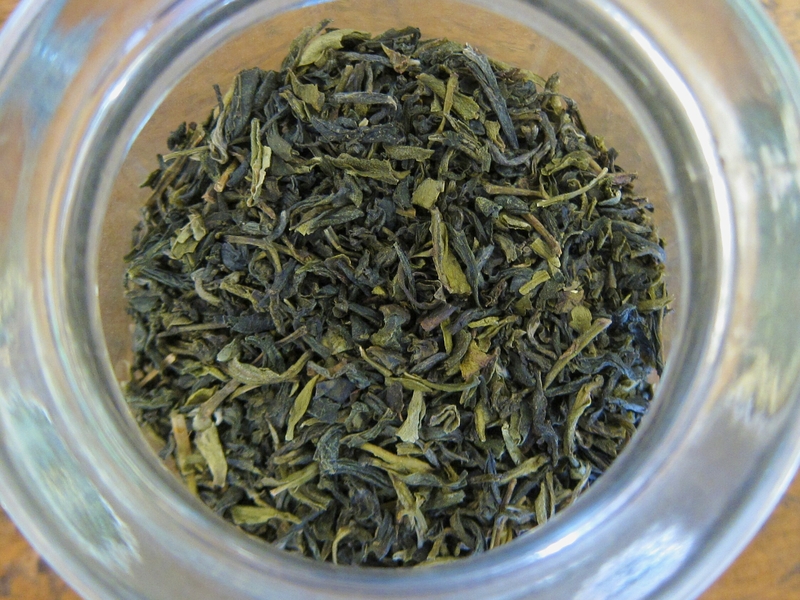 (See my prior post, “How Green is Our Tea?”). 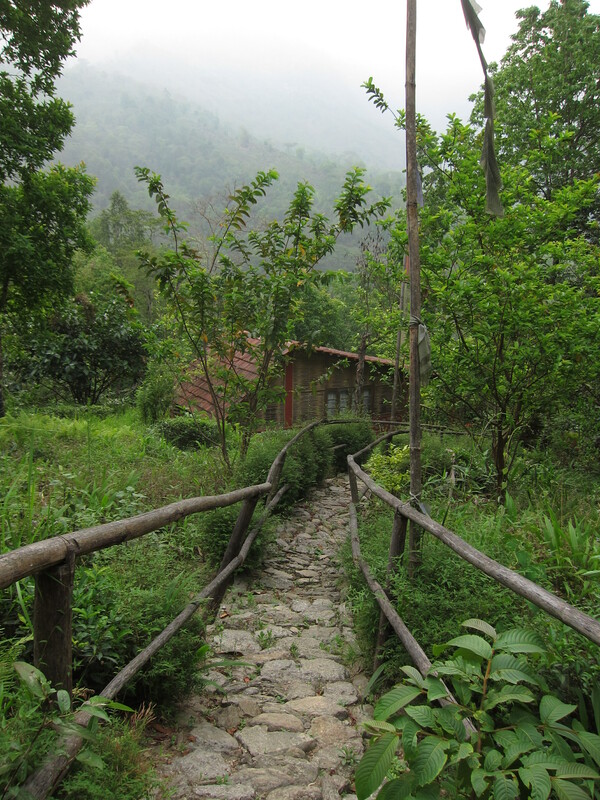 As I walked around the villages with Passang, it seemed we were surrounded by a harmonious, natural ecosystem. It would not be an overstatement to say that it was the most beautiful place I had been so far on this trip to Darjeeling! View from Passang’s home. Behind the mist and the clouds, the immense Mount Kangchenjunga lurks in the distance. I was not the first outsider to be impressed with the landscape. Navin, the owner of Tathagata Farm, did not grow up here. After finishing university, he spent many years working for the NGO, DLR Prerna, that was partnering with the Cooperative. Eighteen years ago he had the chance to buy some land from an absentee owner and join the Cooperative, and he jumped at the opportunity and has not looked back since. 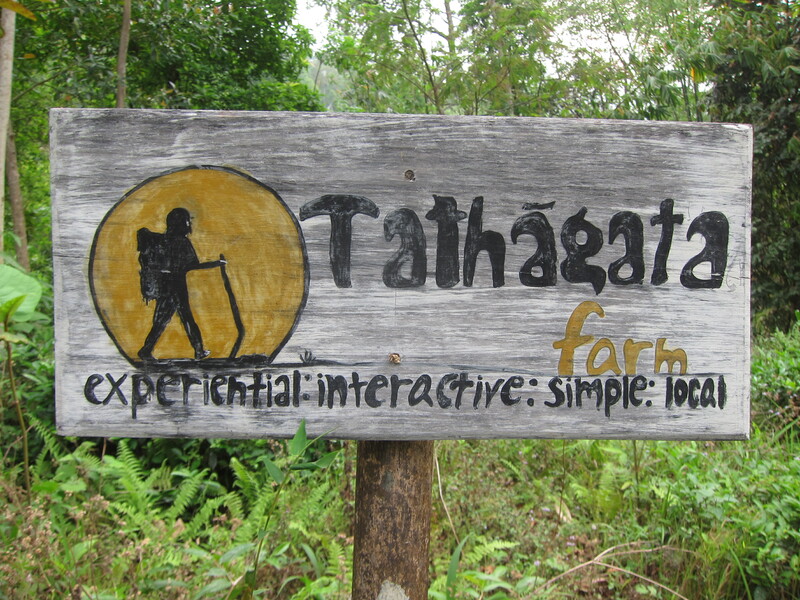 In addition to farming, Tathagata also promotes ecotourism by offering homestays and organizing activities for guests. 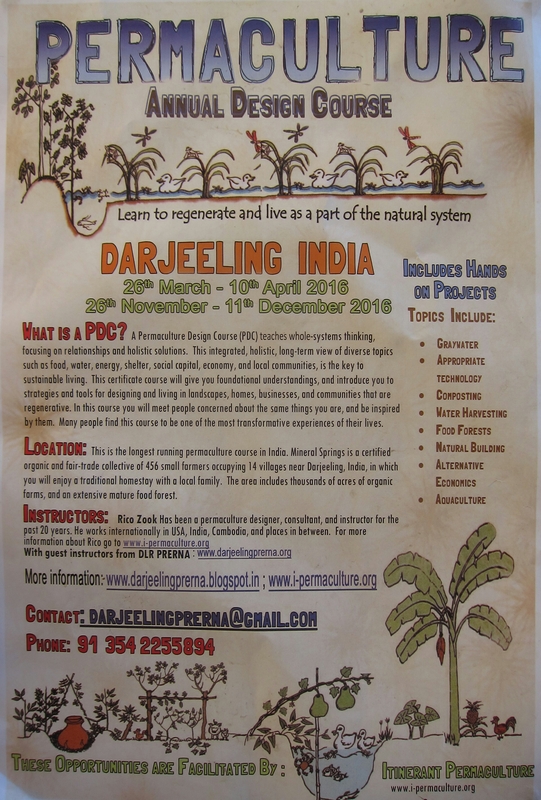 Advertisement for Permaculture Design Course that takes place at Mineral Springs. What a great place to spend a few days – or longer! In addition to the natural beauty, the villages were clean and tidy. The houses were modest but well maintained. 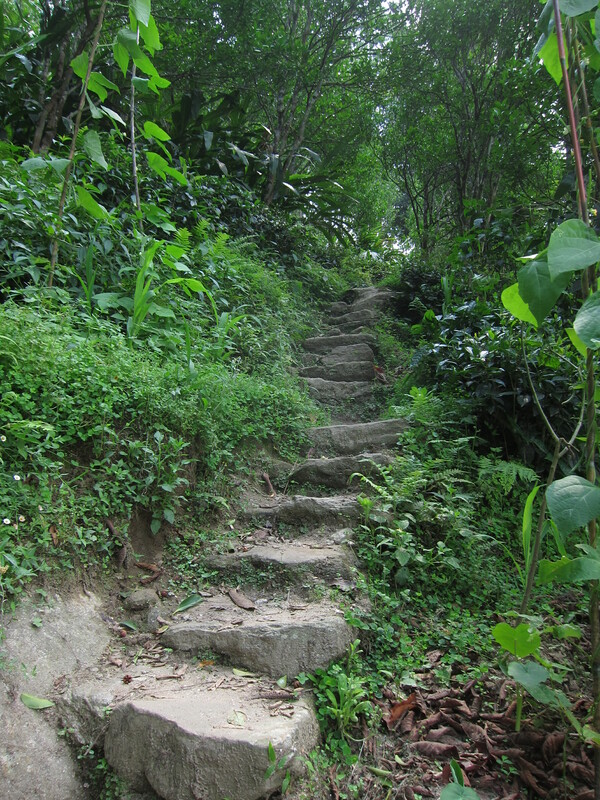 Unlike most of Darjeeling, there is no water shortage here as they have a “perennial water supply” from local springs. The families own their own land. The Cooperative has an elected governance system that includes representatives from its women’s self-help groups. There are no labor shortages, as the farmers work their own land and help each other out when needed. In a region dominated by large estates owned by big companies, Sanjukta Vikas Cooperative is a unique undertaking. And it’s clearly working for the betterment of the land, the farming communities, and for us, the tea consumers. I think it’s a model that other Darjeeling gardens may need to emulate in the future, in order to maintain long-term viability. A good pluck: two leaves and a bud. Kane, Dan. 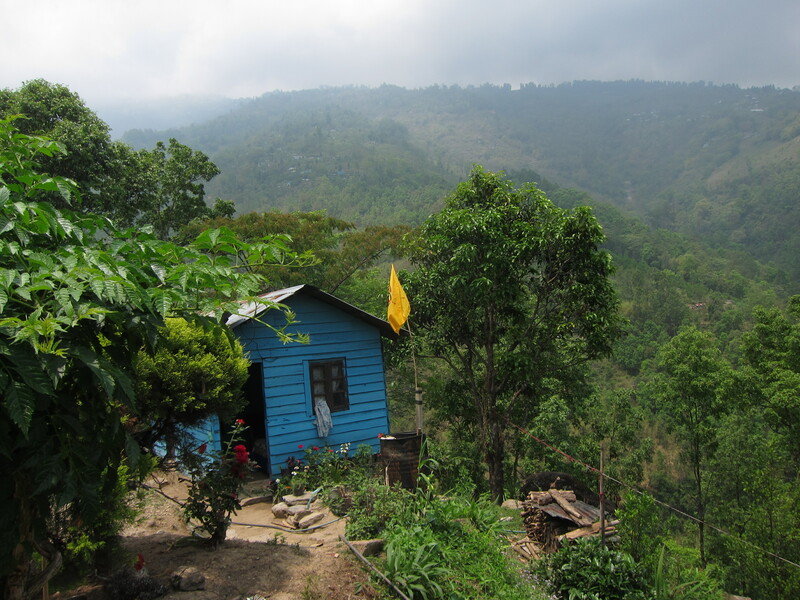 “Challenging Convention: The Sanjukta Vikas Cooperative in Darjeeling, India.” Web blog post. Nourishing the Planet. 17 January, 2011. “Mineral Spring organic and fairtrade certified collective in the Darjeeling Hills.” darjeelingprerna.org. DLR Prerna. Web page. Robinson, Phyllis. 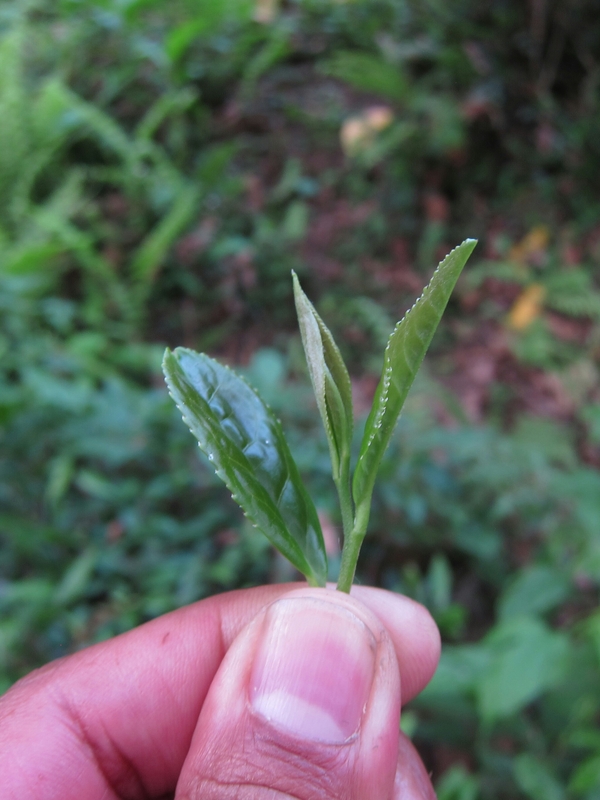 “Transforming the Tea Industry: From Plantations to a Small Farmer Model.” Web blog post. Small Farmers. Big Change. 17 February, 2010. 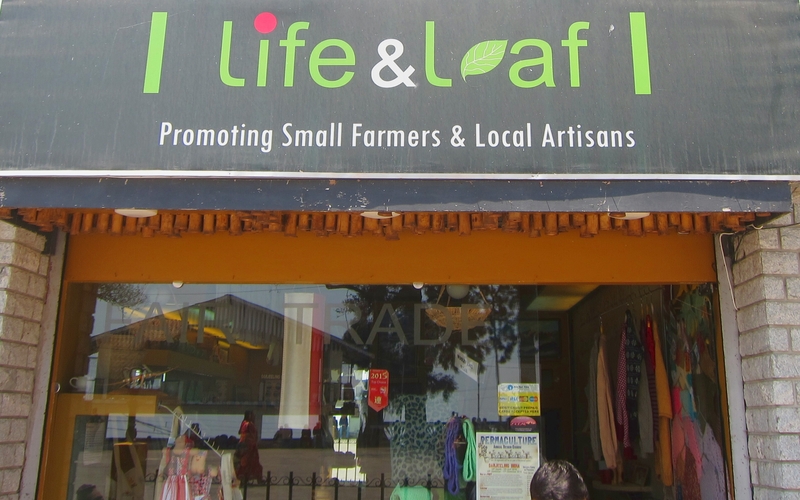 I bought some tea from the Life & Leaf Fair Trade Shop. So beautiful! Sounds like an idyllic place. The history is fascinating, Sharad! It’s nice you are getting to meet good people making a difference in our world! The steps was my favorite picture! Looks difficult to climb but has a promise of eternal peace! It was a really beautiful place, Mythri.